Cross the Artic circle to the Home of Santa Claus and experience the thrill of Reindeer sleigh rides and snowmobiling against the backdrop of a magical winter wonderland. Whether you’re in the Christmas spirit or not, there are many reasons to visit magical Lapland. Lapland is located in the northernmost region of Finland and borders with Norway, Russia and Sweden. The views here are absolutely phenomenal and that’s without mentioning the sensational Northern Lights. This winter paradise offers fun for everyone and continues to attract thousands of skiers and snowboarders every year. Our 3 main ski resorts in Lapland are Levi, Ylläs and Saariselka. Iglu Ski sells ski holidays in Lapland all winter from Decemeber until the end of March and festive Lapland holidays in December (non-ski). There are miles of unspoiled landscapes in this stunning corner of Finland. The sport is a key part of the culture here and you can expect fantastic advice from locals that will push your abilities even further. Lapland has invited visitors for years, developing a strong reputation as a premier ski resort as well as a fantastic family getaway. There is so much to do here and the hospitality and facilities are exceptional. The ski season in Lapland runs from November to April, with snow cannons available for when the coverage is poor due to dry spells. 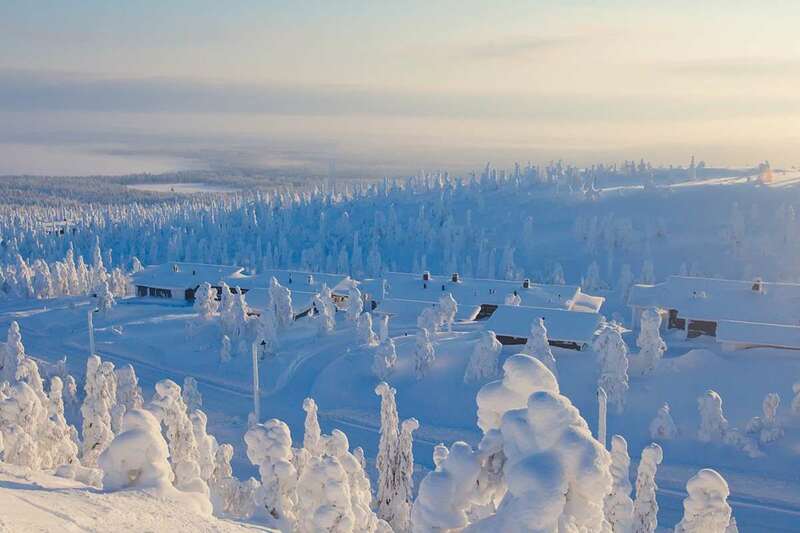 There is three main resorts across Lapland: Levi, Yllas and Saariselka . These boast runs for beginners, intermediates and advanced skiers. If you’re new to the slopes, it’s advisable to try the tree-lined routes. These enable visitors to experience the sublime beauty of the area without risking injury by overestimating their abilities! What’s more, the terrain adds up to a total of 144.7km, providing plenty of choice for skiers. Whether you’re looking for kid-friendly surfaces or tough downhill journeys, there is a lot to look forward to in this magnificent resort. Saariselka is not just the home of Santa Claus and his Elves but also home of the local Sámi people, friendly reindeer herders with ancient traditions and excellent cuisine. Here you can enjoy a three or four night break in your own cosy, catered log cabin, complete with log fire and Christmas decorations. Pay a visit to the Igloo village’s Ice Gallery with its exquisite Ice sculptures, and then take the kids tobogganing… If they’re not too exhausted after a day of Husky sledding! Top of the list for things to do is meeting the man himself, Santa Claus. His Grotto is a short distance away from Ruka and is a magical experience that is sure to put visitors in a festive mood. When you’ve finished greeting Father Christmas, you can look forward to a host of other activities, including ice rally driving and snowmobile trips. These showcase the indisputable beauty of the region and present some unmissable photo opportunities. Bask under the glow of the Aurora Borealis at the top of the world, set against a snow covered landscape; a trip to Lapland is a truly unforgettable Christmas adventure for both adult and child alike. The closest airport to Lapland is Kitila, which can be reached in around 20 minutes by bus.